Europium-doped Cu2O thin films were prepared by simple successive ionic layer adsorption and reaction (SILAR) with different Eu doping concentrations: 1%, 3% and 5%. 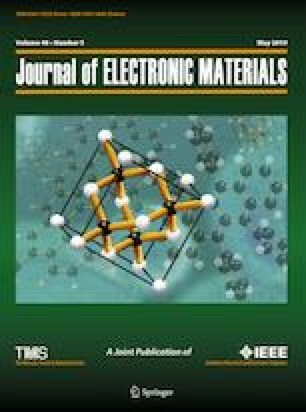 The effect of doping level on structural, optical, surface morphological and electrical properties of the films were studied by x-ray diffraction analysis, UV–Vis spectroscopy, scanning electron microscopy and Hall effect measurements, respectively. Crystallite size, dislocation density, microstrain and texture coefficient of the films were estimated using x-ray diffraction data. The crystallite size was found to vary between 27 nm and 21 nm for the change of doping percentage 1–5%. Morphology of Eu:Cu2O and ZnO films had cauliflower and hexagonal shapes, respectively, without any cracks. Optical studies done on the films revealed an increase of band gap as 2.08 eV, 2.26 eV and 2.41 eV for Eu doping concentrations of 1%, 3% and 5%, respectively. The ZnO film showed a maximum of 80% transmittance and band gap of 3.20 eV. Photoluminescence (PL) studies revealed two emission peaks centered at 394 nm and 377 nm for the Eu:Cu2O and ZnO films, respectively. Eu:Cu2O/ZnO heterojunction solar cells were also prepared and their properties studied; they were found to show increased open circuit voltage and short circuit current for 5% Eu doping concentration.